As we approach our final week of preparation for the holiday of Passover, my mind turns to the art of telling the story of Passover. Stories are more than simply their content, they are the methods, the timing, the layers of how that content is shared, and the story of Passover is no different. Our primary method of telling the story of Passover is through the reading of the Haggadah at the Passover seder. It is an ancient ritual, but not that ancient. The seder was crafted by the rabbis of the Tannaitic period (approximately 100-300 CE), which means that this scene most definitely never happened. So how was the story of Passover shared prior to the seder? Perhaps the reason the rabbis focused the haggadah on interpreting these verses was to keep the continuity of the Passover ritual from one generation to the next. In other words, prior to the seder, Jews would tell the story through performing a sacrifice. Thus the seder tells the story through the lens of that sacrifice. 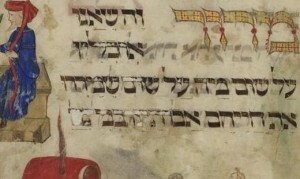 We continue that tradition today our use of the haggadah, yet in recent years there has been a shift away from simply reading the haggadah in the fashion of our ancient rabbis, to telling our own stories of the meaning of the Passover. In other words, just like the rabbis adapted the story of the ancient sacrifice to fit their storytelling style, so too do we adapt the rabbis’ version to create a meaningful story for ourselves in connecting with this beautiful holiday of redemption and freedom. Over the course of the next couple of weeks we will have many opportunities to share the Passover stories in some unique and personal ways (so please stay tuned for our weekly events and services email on Wednesday). Through our storytelling, both in words and in rituals, we will continue the tradition of telling story of Passover as it must be told to be meaningful to our generation.